By Liz Primeau, Special to The Globe and Mail, North York, Ont. Even on a barren and chilly November day, North York's recently renovated Ledbury Park, northeast of Lawrence Avenue and Bathurst Street, has style. The view of the new reflecting pond-skating rink, from the graceful, slatted bridge arching over it, evokes classic European gardens. The long, rectangular sheet of silver -- water in summer, ice in winter -- has a distinctly formal air. Set 1.2 meters below the rest of the park, it's protected and framed by a grassy embankment that rolls upward to meet a promenade accented by a row of pleached linden trees. On the other hand, the idea is very Canadian. The rink, 100 meters long and 15 meters wide, encourages sweeping strides that are hard to work up to when skating on a conventional hockey-size rink. Howard Sutcliffe of Shim-Sutcliffe, the husband-and-wife architectural firm that designed the renovation, finds echoes of Ottawa's Rideau Canal in the project. "We generally refer to it as the skating canal." he said with a grin. Turn a half circle to see the opposite end of the rink and thoughts of Europe disappear. The skate-changing pavilion is glass from floor to ceiling, and juts out toward the water (or ice) like a boathouse at a northern cottage. "And right over there," said Brigitte Shim, pointing to a barely visible door to the left of the change room, "is where the Zamboni comes out to clean the snow off the ice. With this project I had to consider things I'd never looked at before -- like how high is a Zamboni with a person sitting on it. We couldn't have them bumping their heads on the bridge." Public parks aren't a project Shim-Sutcliffe normally takes on. They've won four Governor-General's awards for houses and a garden pavilion, including their own inner-city home, and several awards for domestic designs such as a mailbox and a dining table. 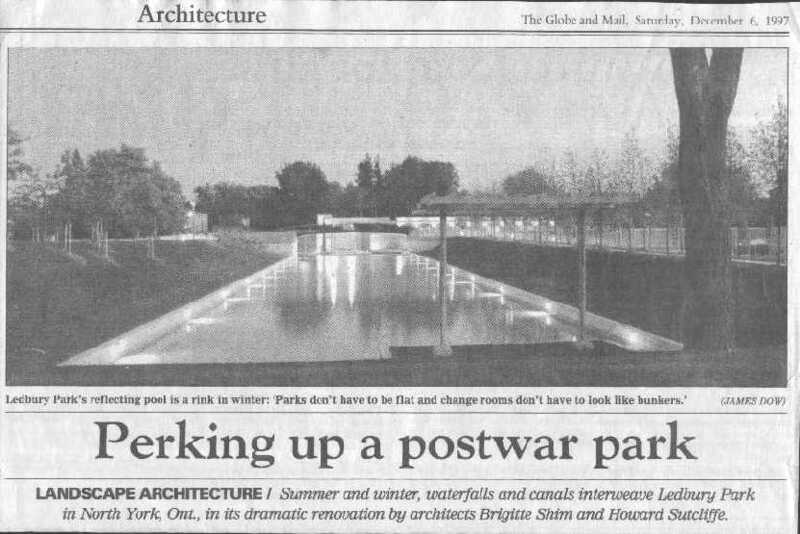 Ledbury Park received a Canadian Architect award of excellence in 1996, during construction. The firm's success at integrating architecture and landscapes encouraged Derek Nicholson, supervisor of parks and facility development for the City of North York, to invite the architects to design a new look for the old park. "I'd seen a garden pavilion they did in a homes magazine, and was really impressed with how they tied the water elements and the building to the ravine," he said. "So once the city decided to go ahead with a renovation I just went to their house one night and asked it they might like to work on the project. At first I could see them looking at each other wondering who this guy was, but eventually I convinced them I was serious."